← The Age of Man? So, today we kissed a comet. Many of us shared the excitement of the European Space Agency’s successful landing. Something built on the Earth is now sitting on a comet, traveling at 135,000 kilometres an hour, heading towards an even faster spin around the sun. The sheer scope of the engineering is astounding – the spacecraft traveled over 6 billion kilometres pursuing its target and the rendezvous took place 500 million kilometres from the mission’s control room in Germany. Rosetta’s speed had to exactly match the speed of Comet 67P/Churyumov-Gerasimenko when its lander, Philae, was sent to touchdown. The lander lit on the comet as one might settle on a park bench after a long casual walk. Almost softly and gently taking its seat, with just a slight rebound. 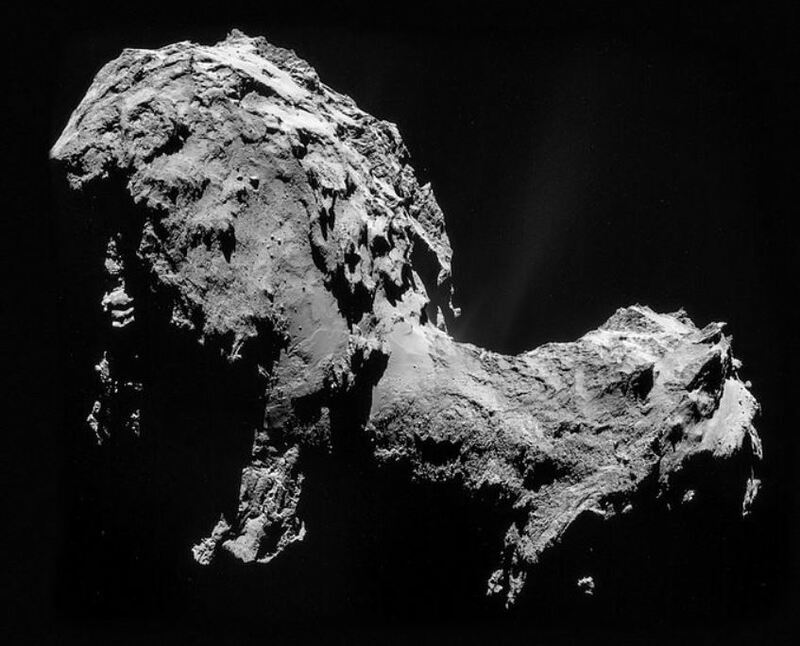 I hate to be the one to say it, but Comet 67P/C-G doesn’t look much like a comet. In fact, it is rather ugly. And, if reports are correct, it is rather smelly, too. A comet only a mother could love. And, I suspect, a few hundred Europena space flight engineers. 67P is mottled, grey, warty. It is irregularly twisted. With some imagination, the image released by the European Space Agency might represent a two-headed chimera. I see an Elsa the lion on the left end, a Scottish terrier on the right. At just 4 kilometres in length, this flying creature will not it light up the night sky. Visually, it will neither delight nor terrorize anyone on its dash around the sun. In the past, comets were almost universally an omen that terrorized onlookers. That’s hard to believe today. I remember watching Hale-Bopp in April 1997. My best view was quite accidental – I was standing at a bus stop just before sunrise. I pointed out the comet to others waiting. I especially remember the man who wouldn’t look. He somehow thought it was a prank – make the unwary gentleman search the sky for the elusive comet, lots of laughs. But it was no hoax and when the fellow finally dared to look, he dropped his pack and muttered profane words of astonishment. A good view of a superior comet can have that effect on anyone. Hale-Bopp’s 1997 appearance at the Calgary bus stop did not send shudders of fear down the spines of its witnesses. Had it appeared a thousand years earlier, it certainly would have. Mayans, Aztecs, Chinese, and Europeans all thought comets bade only misfortune. Comets brought unexpected deaths, famines, revolts against the king. I guess you would not want to be the royal astronomer who first spotted a new comet in the sky. For nearly 2,000 years, people believed Aristotle’s tripe about comets – comets, he said, lived in the realm between Earth and Moon. They were part of our atmosphere and understandably, they could influence life on Earth. It wasn’t until Tycho Brahe (1600) proved that comets occupy space much, much further away from the Earth that people quit fearing comets. Only if one should colllide with the Earth should there be much cause for dread. And in that case, the dread would be short-lived. Newton and Halley put a final end to superstitious musings about comets. Newton proved the elliptical shape of their paths and Halley made predictions of comets’ returns. 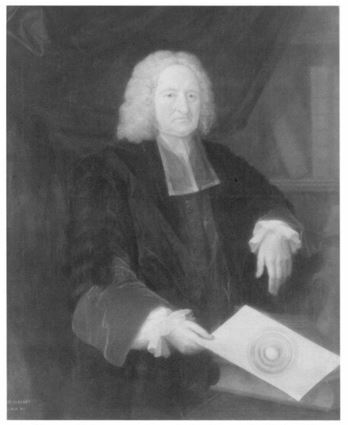 Edmond Halley with his sketch of the Earth’s inner layers and core. Edmond Halley was interested in everything. He explained the newly discovered problem of magnetic drift which made compasses slowly less accurate. Halley suggested that extreme internal pressure gives the Earth a solid iron core. The crust we stand upon is also obviously solid. But Halley brilliantly surmised that some type of fluid separates the two solids. He believed the fluid region of the inner Earth produces the magnetic field, but due to sluggish rotation of that liquid, the magnetic pole is drifting. Halley was partially correct; he was certainly right when he identified distinct inner-earth layers. He was one of the first to understand the differentiation. Halley had a knack for clear reasoning in other areas of science, too. He said solar heat was the cause of wind. He discovered the relationship between barometric pressure and elevation. Halley edited his friend Newton’s great study of physics, Principia, then printed it when the Royal Society failed to find the cash. And, of course, Halley predicted the return of the comet which others named in his honour. Halley was England’s Royal Astronomer but he didn’t receive the job he really wanted – Oxford Professor of Astronomy. The Archbishop of Canterbury vetoed the appointment due to Halley’s well-known atheism. 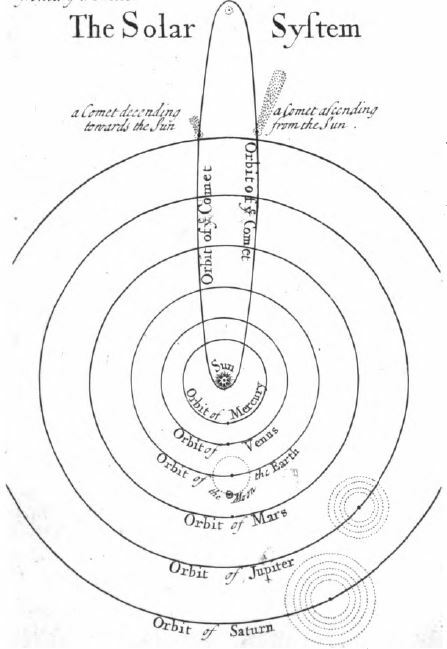 Whiston’s 1696 drawing of the solar system – good enough for some of today’s high school text books. Comets were becoming a thing of nature rather than a messenger of gods. A Brit named William Whiston wrote a very popular book, A New Theory of the Earth (1696), that tried to reconcile stories from Genesis with Renaissance discoveries from science. Comets played a big role. Whiston was one of the smartest men of his era. He followed Newton as Chair of Mathematics at Cambridge and he produced an extraordinarily popular translation of Josephus’s History of the Jews – after the Bible, Whiston’s version of Josephus was the most widely-owned book in England. For Noah’s Flood, Whiston had the necessary water delivered on the tail of a comet. Whiston correctly identified that comets contain water and his 1696 drawing of a comet’s orbit is among the earliest printed diagrams showing the Earth revolving around the Sun. Except for perfect circles, rather than ellipses for the planets’ paths, his sketch of the solar system could almost sneak into a modern Kansas high school textbook. 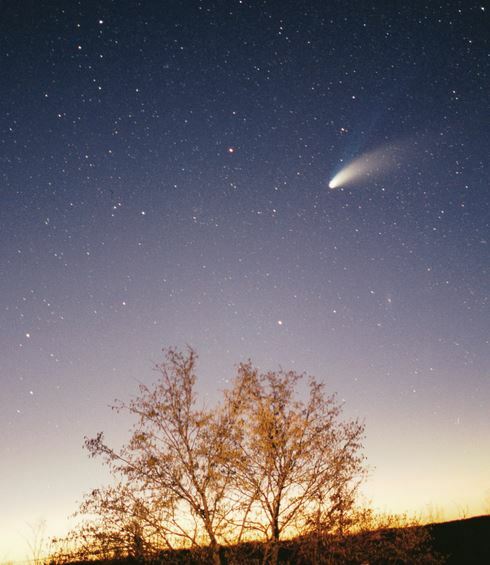 Whiston also maintained that the Earth itself originated from the atmosphere of a comet and most changes in Earth’s geological history could be attributed to the action of comets. God created the Earth out of the atmosphere of a comet, and then engulfed it in a Great Flood with the tail of another. His book, with its nod to a world designed by God, then set in motion and allowed to run on fixed laws, was well received by Isaac Newton, John Locke, and other notable contemporaries. Comets enamoured Whiston. He caused a bit of a panic in London when he predicted that one of those comets would collide with the Earth on October 16, 1736, and bring an end to life on the planet. It didn’t. Into our own times, one of the most bizarre cases of pseudoscience involved a psychiatrist named Immanuel Velikovsky. Velikovsky gained fame for his best-selling Worlds in Collision which offered an alternative view of the evolution of the solar system. His book claims Venus was once a comet ejected from Jupiter and the new comet Venus swept near the Earth in 50-year intervals, disrupting the planet’s spin and orbit, leading to some of the dramatic events portrayed in the Bible – including the plagues of Egypt and the parting of the Red Sea. At one point Venus stalled near the Earth, giving Joshua the extra hours of sunlight the Bible said he needed to slaughter the Amorites of Gibeon, following God’s orders to kill every Canaanite on Earth. According to Velikovsky, Comet Venus helped Joshua in his battle, and the planet carried pestilences of flies that originated on Jupiter. Those flies and other Jovian creatures were the source of Earth’s current petroleum deposits. Decaying organic bodies of creatures from Jupiter, said Velikovsky, were carried to Earth on the comet tail of Venus. He also argued persuasively that Saturn had once gone through a nova state, ejecting a huge quantity of water into space, which found its way to Earth on a comet and caused Noah’s flood. Velikovsky also proved (at least to his readers) that the planet Mercury was involved in the collapse of the Tower Of Babel, and Jupiter in the destruction of Sodom and Gomorrah. I don’t make these things up. Velikovsky wrote sincerely and stretched science to fit his stories. And he made millions from book sales. Worlds in Collision was enormously popular in the 1960s and 1970s. It (and Velikovsky’s sequels) sold tens of millions of copies. Study groups formed in high schools and colleges across the USA. Velikovsky’s pseudoscience appealed to many who wanted to believe the literal word of the Bible, yet also needed to support their belief with some type of science. Although Velikovsky had no training in physics or astronomy, he persuasively explained Old Testament miracles with an imaginative flair that seduced millions of followers. Geologists dismissed Velikovsky’s charming hypotheses, inadvertently strengthening his standing among those who recognized the dismissive tones as a conspiracy among mainstream scientists to hide the true nature of the solar system. Velikovsky offered a non-mathematical solace with his entertaining religious-scientific synthesis. It did not take much depth of thought to be swept away by his tales – in fact, that was perhaps a prerequisite. Readers came to the defence of the doctor whom they saw as a persecuted scientific martyr attacked by the establishment. Geologists objected and Velikovsky’s books sold better. But that was then and this is now. Today, Philae is apparently perched on a small comet dashing around the solar system. Don’t expect plagues or deluges or harbingers of death and destruction. Instead, celebrate with the European engineers who pulled off a marvelous achievement. This entry was posted in Culture, Engineering, Exploration, History, Religion, Science Education, Space and tagged comets, Edmond Halley, European Space Agency, Halley, history, Immanuel Velikovsky, myths, Philae, Rosetta, Whiston. Bookmark the permalink. Hale-Bopp was well-positioned for me, when it was best visible. It was almost exactly in my line of sight walking from campus back to my apartment in the evening, just when I’d want to. Joseph – Thanks, Hale-Bopp brings back some good memories, doesn’t it? By the way, I’ve been enjoying your math/science blog immensely!